Personally, I love flashlights from Streamlight as they have outstanding features and meet the different needs of users. Of course, this depends on the type of flashlight you’re buying. Not only flashlight, Streamlight brand also has lots of quality lantern lights. One of the top lantern from Streamlight that I have used is the Streamlight super siege. The light is covered by rubber which protect USB and Charge ports. 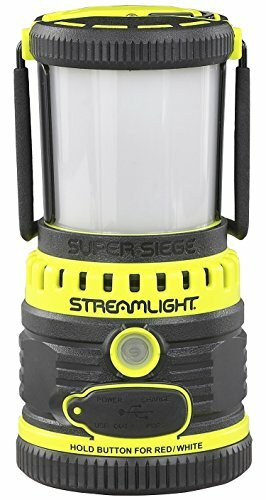 The Streamlight super siege lantern is a great work light. It provides a maximum of 1100 lumens for 5 hours and the minimum of 125 lumens for 35 hours. The red light is ideal for use at night as it is not as powerful as the white light. Read this Streamlight super siege review to know why I am recommending this light. If you’re a flashlight aficionado, then you have come across, owned or used a flashlight from streamlight. The Super siege lantern has same type quality. It has an easy to use on/off button and a battery level indicator for letting the user know when its time to charge the lantern. The battery the lantern uses is rechargeable and it has a portable charger. It’s design eye catching too. 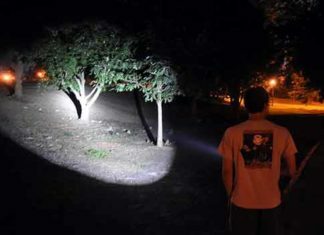 4 Why use the streamlight super siege led flashlight? Why use the streamlight super siege led flashlight? As sleek as it looks, the super siege led lantern is sturdily built to last long. The lantern is featured with rubber bumpers that are added almost everywhere. Actually, everything black on the lantern is thick rubber. Also, the body is covered with rubber and it feels like sticking to your hand. The battery cap and top reflector lock perfectly into place and thick O-rings contribute to the water sealing all around. These add to the durability of the lantern. The handle on the device come with some sort of textured rubber coating and some click stops to keep it in case you need it docked net to the diffuser. Furthermore, the metal hook on the bottom is very solid and can be used to hang the lantern in a room or in the tent. Operating this sturdily built lantern isn’t a problem at all. This is because it comes with a simple on/off button. To switch the light on, you will need to press the on/off button for it to light. The lantern starts lighting with the low mode, then to medium mode, and lastly, high mode. The light doesn’t hold any memory and thus, you will be required to press different modes when you need them. For instance, if you ores and hold the button, it will adjust from white to red light. And when you press it fast, it will go from steady red to blinking red or SOS mode as some refer to it. When you press it again, it goes off. A long press again will make the light to return to white. Moreover, the flashlight is ergonomically designed for easy use as you work. You can use it with or without the outer globe cover. The lantern can be hanged upside down by getting rid of the outer cover. The D-ring attachment makes this possible. One is at the top and another at the bottom. The lantern enables you charge your phone more than 4 times through the USB charge port. You can as well store some of your valuables while out camping in the storage compartment which is below the bottom of the lantern. This storage compartment is watertight with seals to prevent water from entering inside. One of the things that made me fall in love with this streamlight lantern is that it has very bright light. The maximum lumen of the flashlight is 1100. When it operates on high lumen, it will last for 5 good hours. But it also has a low lumen of 125. This will run for 35 hours, which is more than one day. The medium lumens for white light are 550 lumens for 10 hours. This is extremely bright than most flashlights on the market. Such a feature makes it to be ideal for camping. This applies for the white light. When the flashlight is running on red light, it will operate for more hours. The red light uses less lumen when compared to the white light. 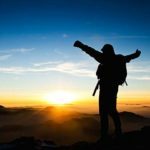 It uses a maximum of 2.7 lumens for up to 110 hours, low of 1 lumen for 288 hours, and SOS mode of 2.7 lumens for 230 hours. The red light is normally used at night as it doesn’t affect your vision. But the glare guard that the light comes with will help reduce the glare produced by white light and you will have nothing to worry about. A friend of mine asked me how he will put the batteries in this lantern. This is a question that many people want to ask when they first encounter the super siege lantern. The process is easy and straightforward. All you need to do is to unscrew the bottom about a quarter turn. Then, place two AA positive batteries down and one positive battery up. Place the cover back by combining the two tear drop-shaped plastic parts. After this, you can go ahead and light the lantern. After buying this lantern, many people are always surprised about its size. This is because many people expect a large lantern with a huge bulb. But this is not the case with the Streamlight Super Siege lantern. Even though it’s small and compact in design, this lantern is very powerful and will light a dark room very well. Its compactness makes it able to fit in tight places like the store, tent or garage. The problem with some top brands is that they don’t offer a warranty and customers don’t feel protected. A warranty enables clients to have full confidence in the product and buy it without second thought. The super siege LED lantern is well built and does what it says it does. In addition, Streamlight provides a lifetime limited warranty to buyers of the lantern. So, they can be assured that this is a quality and highly functional light. To sum up, the streamlight super siege is a wonderful light for camping, working, charging phone, and many other uses. It is durably constructed and can survive the tough conditions of outdoor. It comes with different light modes that allow the lantern to run from 5 hours on the brightest mode and 35 hours on the lowest light mode. The light produced from this powerful super siege lantern is very bright and it can be positioned in different ways to suit your needs. With a lifetime limited warranty from the manufacturer, expect this lantern to serve you for a very long period of time. Hope you’ve found this Streamlight Super Siege review to be very helpful. How long does the super siege lantern need to charge for full charge? It may take 7-8 hours to full charge(1100 lumens).